This is my favourite go-to Summer dessert because it’s so simple and delicious. It’s barely a recipe at all. Basically mix up a bunch of summer berries in a glass or ceramic bowl (about 1 punnet per person) with Cointreau and if the berries aren’t that sweet, then add in some sugar to taste. If the strawberries are large, halve or quarter them. Cover with cling film and put into the fridge, stirring occasionally. The longer the berries macerate in the Cointreau, the better. You can also do this with just strawberries (a bastardized version of Strawberries Romanoff) and I’ve been known to whip this up and eat it straight away and it’s still very yummy. 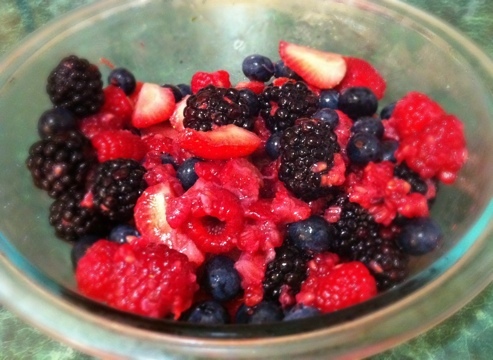 Serve with whipped cream, clotted cream or if you’re being lazy, like I often am, just pour the cream over the berries. If you are making this for one, I just fill up a bowl with the berries and pour over the Cointreau, mix them up then pour cream over the top. 1. Heat oven to 375 degrees. Grease an 8- or 9-inch square baking or gratin dish with a little butter. Toss rhubarb with white sugar, orange or lemon juice and zest, and spread in baking dish. 2. Put the 6 tablespoons butter in a food processor along with brown sugar, flour, cinnamon and salt, and pulse for about 20 or 30 seconds, until it looks like small peas and just begins to clump together. Add oats and pecans and pulse just a few times to combine. 3. Crumble the topping over rhubarb and bake until golden and beginning to brown, 45 to 50 minutes.